Bullitt Group will revive the Kodak brand with a smartphone aimed at photography enthusiasts that will launch next month at CES. Mobile device manufacturer Bullitt Group plans to bring back notorious brand Kodak with style, as they plan to launch "a range of Android-powered mobile devices offering best-in-class image management software and features along with great design and UI." The first such device will be unveiled at CES 2015 next month and will get three companions "across the second half of 2015 including a 4G handset, a tablet, and a connected camera." According to the official press release, these new devices will offer easy access to both image printing and sharing services but will not compromise on user experience or design. They will come loaded with Google's Android OS and will pack high-end smartphone features while focusing on design and usability as well. While there are no technical details about the first Kodak Android-powered handset available right now, it will be shown at CES 2015 in South Hall 1, Booth 21818. We will get back with more information as soon as it becomes available. Aimed at - but not exclusively for - consumers who want a high-end experience but aren't always as comfortable using increasingly complicated mobile devices as they would like to be, the range of smartphones and tablets will come pre-loaded with bespoke image capture, management and sharing features to offer a rich user experience. 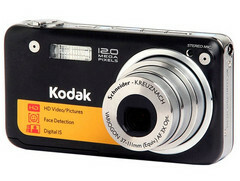 "Kodak is one of the world's most recognisable brands. It is trusted by consumers as a marque of quality and innovation," says Oliver Schulte, CEO Bullitt Mobile. "We've taken that heritage and used it to inspire a range of beautifully designed devices that will let users take great pictures and edit, share, store and print them in an instant." Adds Schulte: "Delivering simplicity without compromise, these devices will address a segment of the mobile device market that has been poorly served to date. By giving customers easy access to printing and sharing services while still offering the latest Android OS and features found on high-end smartphones, we will appeal to a large audience of users who value ease of use and stylish design as highly as they value functionality." Eileen Murphy, VP Brand Licensing, Kodak is excited to be entering the mobile handset market with the Bullitt Group. "We are impressed with Bullitt Group's commitment to delivering a portfolio of products that embrace the quality and innovation that our brand is known for around the world."